Discussion in 'Latest Political News and Current Events' started by JuliefromOhio, May 6, 2018. 1. He wouldn’t need to hire propagandist Rudy Giuliani to discredit Mueller. 3. He wouldn’t try to mislead the public claiming Mueller’s team are all Dems. 4. Rep Devin Nunes wouldn’t have issued an incomplete House committee report falsely claiming there was no collusion or obstruction of justice. 5. Devin Nunes wouldn’t be trying to hold AG Sessions in contempt of Congress. 6. Giuliani wouldn’t be saying that Trump doesn’t have to comply with a Mueller subpoena. 7. Trump wouldn’t have lied in the beginning insisting no one his campaign had any contact with Russians. 8. He then wouldn’t have said “so what?” when it came out that many members of his campaign DID have contact with Russians. 9. Trump wouldn’t have lied about the Stormy Daniels affair at the beginning. Now claiming she was trying to extort him. 10. Trump wouldn’t have gone apoplectic when SDNY collected every piece of paper and electronic communications from Michael Cohen. 11. Trump and Republicans wouldn’t be claiming that Carter Page was monitored by the FBI illegally. 13. He wouldn’t be so angry at AG Sessions for recusing himself from the Mueller investigation. If Trump was guilty..........maybe there'd be......... EVIDENCE! Feel free to substitute the word Trump with Obama, Clinton or even Kennedy. Pahleese....stop making a fool of yourself with the glaring double standards and the childish insistence on trying to find a moral high ground that does not exist. To a lefty....his feelings are all the evidence he needs...which is why they will be bewildered by what is inevitable in the court systems upcoming soon. If Trump were innocent, he'd let the Mueller investigation run its course....instead of trying to shut it down. He could shut it down very easily at any time....I thought you knew that. It's not a matter of trying...when he does try it will be shut down. It's actually better to let Mueller continue to make a fool of himself and show the viciousness of the left in so doing. 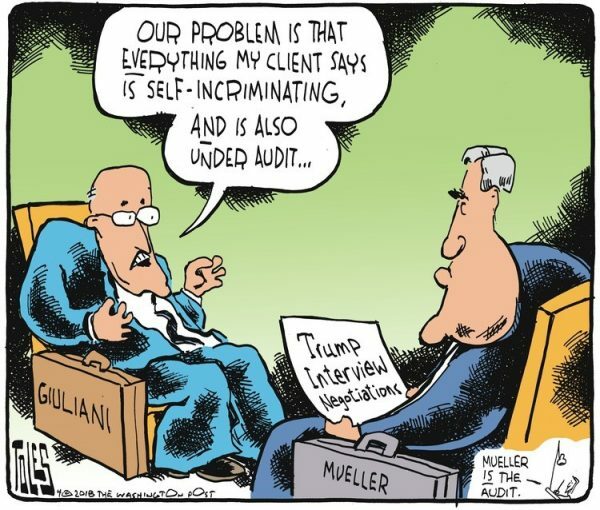 It's working perfectly...and yes I already know that Mueller is supposedly a registered Republican...it doesn't matter.. right now he's just a hired gun. Mueller is not running an investigation he's running smear campaign...he stopped running an investigation away back when they had to admit there was no evince of collusion leading back the the POTUS. Now he's just fishing for anything he can find to justify his paycheck. I wasn't aware Trump was "trying" to shut down tbe investigation. How is be "trying" to shut down the investigation? Can you tell me? You must be too young to remember when Nixon tried that. It didn't work out. I guess FoxNews or talk radio doesn't let you know how often Trump's people talk about it. And if Trump was guilty, you would have disclosed the evidence already and impeachment trials would be in full gear. Instead, you got Federal judges throwing out Mueller’s fake charges and coming close to charging him with treason. I remember it quite well in fact. There is little doubt that the investigation would be re-opened in another way but it would lack the same kind of clout that a DOJ investigation has. So Trump has every reason to shut it down since it has wandered away from its original purpose. Right now they are looking for overdue library books upon which to base an impeachment vote just in case the Dems make some headway in November. Here's a clue. The Dems goddamned well better get the house and Senate back or I can guarantee you they are going to get totally fucked in the months following the next mid term. I would say it's a matter of life or death for them right now and I'm not kidding at all. Yes now that it is reaching the actual court room stages the clownish legal behavior is not going to cut it. Trump hasn't done anything to shut it down. You believe MSM lies to that effect, apparently. First you said Trump was trying to shut down the investigation. But now you're saying it Trump's people talking about shutting down the investigation. Which is it? Truth is I don't see Trump or anybody on his team trying to shut down the investigation. As a matter of fact it's the entirety of the pundits on your side that keep talking about why or when he will shut it down. Why do you think the democrats want him to end the investigation so badly? Just keep pretending that Trump hasn't been thinking for 14 months about how he could fire Mueller without blowback. This has been in the real news for that long. 1. He's furious with Sessions who, if he hadn't recused himself, would be the one who could end the Mueller investigation. 2. Rosenstein is in charge of Mueller and Trump wanted Sessions to fire Rosenstein and replace him with someone who could control Mueller....in the way Trump wants. If Trump were innocent, he wouldn't be thinking of ways to stop Mueller.